People are moved by the Spirit in myriad ways. Those who choose religious life take a road less traveled. Our goal is to put a human face on this countercultural way of living. Along the way we will explore questions of faith, God's unique call to each of us, and the process of discerning a vocation. “People will be able to find each other and work together online, and then go back and use what they have learned or done in their own communities," says Sister Judith. The 57-year-old Franciscan nun, originally from Long Island, has used her technical skills to become the editorial director of the Internet Office of the Holy See. 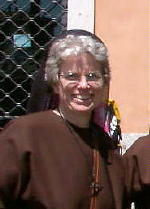 Sister Judith was first called to the Vatican in 1991 in order to help the Holy See enter the then-burgeoning internet. When she arrived, she quickly formulated and pitched the idea of a Vatican website to Pope John Paul II. The pope approved of her idea, and over the years the site has grown so considerably that it now attracts nearly one million visitors per year. Visit the Vatican website at www.vatican.va. I just learned about Sr. Judith and I am very impressed and inspired by her and her work. Thanks for posting this. Great site, by the way. There should be more uplifting sites/blogs like yours on the Internet.